Tua's father essentially admitted to abusing him, and all we got was a puff interview and some Joe Jackson jokes. A Tom Rinaldi College GameDay interview has a certain rhythm to it. Rinaldi probes the past in his lilting cadence, steering the subject towards whichever surprising/sad/uplifting/revealing moment from their past he’s decided will function as the fulcrum for this story, and we all come away knowing a little bit more about whoever he was talking to. Today, though, Rinaldi’s feature on Alabama quarterback Tua Tagovailoa and his upbringing included an almost tossed-off revelation that Tagovailoa’s father regularly beat him with a belt for poor play on the football field. Tua: If I don’t perform well, perform the way I’m supposed to, I’m going to get it after. Rinaldi: When you say “I’m going to get it”, just be clear what you mean there, Tua. Tua: Well, just know the belt was involved, and other things were involved as well. It’s almost the same with school. If I don’t get this grade, I’m going to have to suffer the consequences. Rinaldi grinning and lightheartedly teasing out the details of Tua’s apparent abuse as though he were setting someone up to reveal they once collected rare coins was incredibly odd. And it is abuse; no spanking statute in the country would allow a parent to hit a kid with a belt for poor play on the field. ESPN just aired Last Days of Knight this week, an entire 30 for 30 about the perils of abusive coaching methods. Galu Tagovailoa: I was tough. He could go 15-15 with 4 touchdowns, but when he throws a pick, it’s the worst game. Did Tua say on Gameday he would get hit with a belt if he had a bad game or threw an interception? So Tua Tagovailoa's dad beat him with a belt if he played poorly in high school? Seems like a nice guy. What a totally bizarre feature on College GameDay. Howard: I saw that his dad was like the Hawaiian version of Joe Jackson, there’s no way Alabama’s going to lose that game, cause out comes that belt! 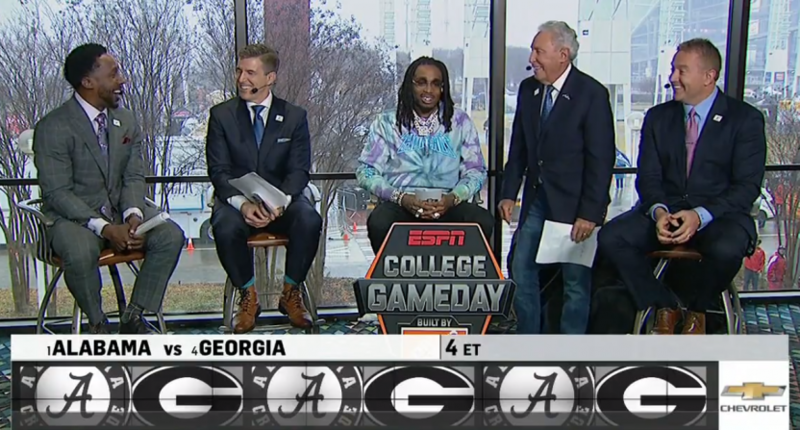 Note: Quavo is the only guy on set there who can’t believe what he just heard. Desmond comparing Tua's dad to Joe Jackson and the guys on set laughing about dad beating him today if Bama loses has to be an all time low point for @CollegeGameDay. And Desmond Howard jokingly calls Tua's dad "the Hawaiian version of Joe Jackson." Not a banner morning for College Gameday. Laughing about a very legitimate Joe Jackson comparison in the wake of finding out the likely Heisman winner was abused (and very recently, Tua is only 20, so this isn’t some distant past memory) is so tone-deaf it was shocking. But at least Howard understood what he’d just heard! He at least called it out for what it was, although his methods were far from ideal. Rinaldi’s piece was similarly off-putting but maybe even worse, treating a clearly (and potentially criminally) abusive parent as some kind of virtuous guide whose methods have paid off so we can all go home with our normal Tom Rinaldi post-interview feelings was misguided at best. What would Rinaldi have to uncover to ditch the packaged narrative and actually, you know, ask real questions to his father? How bad would the beatings have needed to be before Rinaldi decided to ask a real question about it, instead of teasing out the trauma from a 20-year-old college athlete on camera in service of a puffy piece? No one came away looking good here. Except for Quavo.